Calculator.nu is an advanced calculator online. It easily solves trigonometric functions. This is the first version of the calculator and more to come. We got some ideas for some more functionality. The output is directly under the calculator it self. The most recent answer is on top. -Clr clears the input window. -Ans writes the latest answer. -Edit puts a previous calculation in the calculator again. -LaTex transforms the calulation into an image. -Source displays some HTML to view the calculation on a website or a forum. Here we are going to show you how to solve simultaneous equations. Simultaneous equations are a set of equations containing multiple variables. We will show you a graphic solution, the substitute method and the addition method. We are not going to show you how to solve simultaneous equations using a matrix. That might be a later post. There could be many solutions. We want to find a value on X and Y that satisfies both equations. If we draw both the lines on a paper it will look like this. 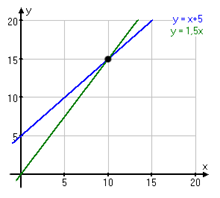 The point where the lines intersect has coordinates x=10 and y=15 and that is our solution. Simple as pie. Sometimes we want a more exact solution and we don't want to draw any images. That's when you use an algebraic solution. The idea in this method is that we substitute a variable in one equation with the corresponding expression in the other equation. We explain this with an example. We now know x but we still want to find Y. We put the value for X in the first equation. Answer: X=4 and Y=1 satisfies both equations. The idea here is to add the equations together. First we have to make sure that the coefficients in front of the Xes (or the Ys) adds to zero. Then you add the left side of the first equation with the left side of the second equation and the right side of the first equation with the right side of the second equation. The result is one equation with one variable. To make sure the coefficients adds to zero you may multiply one or both equations with a scalar. Answer: x=2 and y=0 satisfies both equations. We can study an other example. Little more advanced this time. We can't add the equation together at once as we did in the previous example. We have to do some multiplication before. We see that if we multiply the first equation with 3 and the second equation with -2 then will the Xes add up to zero. Why we choose X here instead of Y does not really matter. You can choose the variable you think is easier. Answer: x=2 and y=1 satisfies both equations. Today the calculator hit 300.000 visitors since we got online a little bit over a year ago. It's really fun to see that this many people have used our service. It's been a while now since we started this calculator website. It gets more visitor each month and we're really glad that you guys appreciate it! We already have a 100 likes on facebook and we truly hope you keep showing your appreciation!